If you’re looking for your first skateboard or just need a new one because you have thrashed your old up, this is the list for you. 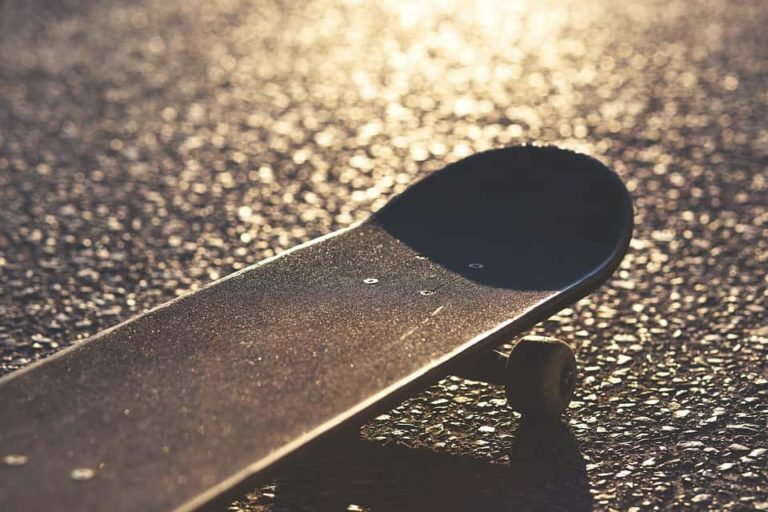 Whether you are a beginner or an all-terrain killer, you’ll find the best skateboard decks for your needs below. Before we get into the list of decks in more detail, have you ever wondered how a skateboard deck is made? You have? Oh good, let’s find out! Most skateboards are made using 7 plys of wood. This wood is usually maple sourced from Canada. 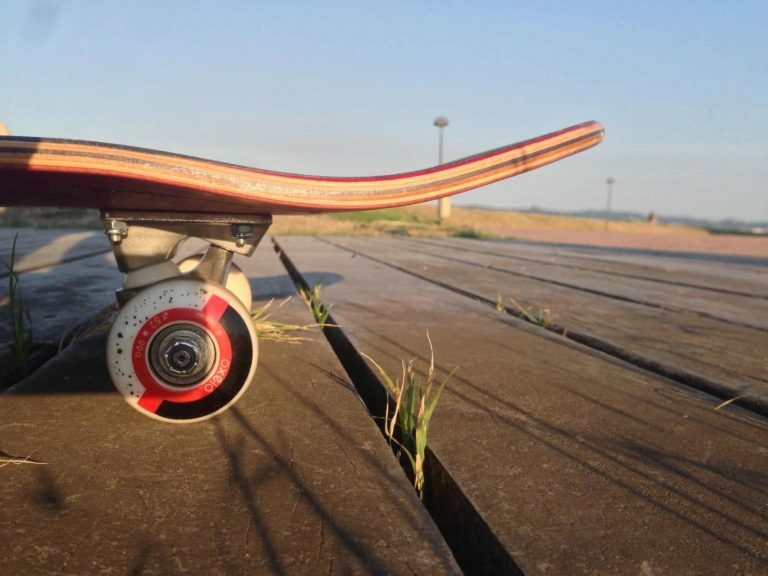 Maple is a hardwood that provides stability and yet is flexible, which is perfect for a skateboard. A skateboard obviously needs to be strong, but it also needs to be slightly flexible so that it can withstand more impact. We’re sure you’ve seen skateboards with colored plys before. These plys are still maple, they are just dyed different colors to make the boards look cooler. A skateboard starts life as 7 individual pieces of wood. The board maker then applies glue to each piece and lays them in a press. This press is hydraulic, and it is used to force the boards into a precise shape. There are loads of different presses and shapes around, most companies have three or four different presses that they use so that their boards can be skated by anyone on all terrains. The boards are left in these presses until the glue dries. Once the glue is dry and the boards have been removed from the press, they have holes drilled into them for the trucks. These holes are drilled using a jig and a precision drill known as a drill press. This means that the holes are in same place every time and no skater has to skate with their trucks on sideways! Once the drilling step has been completed, shaping and sizing can begin. Every board comes out of the press at 10 inches wide. This allows the board makers to make any size and shape of board that someone could want. They use a template of the size they require to make sure that all of the boards are the same. Once this is done, they round over the edges of the skateboard to make them a little kinder on our shines and then seal them with a lacquer or varnish to prevent water damage. For a blank deck, that is it, the board is finish and can be shipped to you or your local skate shop ready to shred. However, boards with graphics need a little more work. There are two ways of getting a graphic on a skateboard. Heat transfer is the technique that most board companies use because it allows them to create more complex graphics. With heat transfer, you can create any design you wish and even transfer photos to boards. With heat transfer, graphics are printed onto a thin piece of plastic and then laid over the board and then the board is run through some heated rollers that conform to the shape of the board. The heat of rollers transfers the graphic to the board and then they are ready to shred. Screen printing is the more traditional way of printing graphics onto boards but isn’t used by many companies nowadays because of the time it takes. If you are very skilled screen printer, you can achieve much the same look as heat transferred graphics, but it's a far slower process. Screen printing works by burning the graphic into a piece of cloth tightly secured to a wooden frame. You need one screen per color you intend to use. You then secure the board in a jig that allows you to place the screens down exactly where you need them. Then, using a rubber squeegee, you spread the color over the board. You do this for each color, lining each screen up as you go. Once you’re finished, the board looks awesome and is ready to shred. There are still companies that use the screen printing technique for board graphics, but they are few and far between. Most skateboard companies use the heat transfer technique to cut down on production costs and deliver us skateboards as quickly as we can skate them. We hope this look at how a skateboard deck is made has been interesting. You can actually watch one being made in this awesome video by Globe too. Before we get to the list of decks, we have one more thing to talk about, the most important part of choosing your board. We are, of course, talking about the size of your board. Most of the time, size doesn’t matter, but when it comes to skateboards, size is one of the most important things in the world! 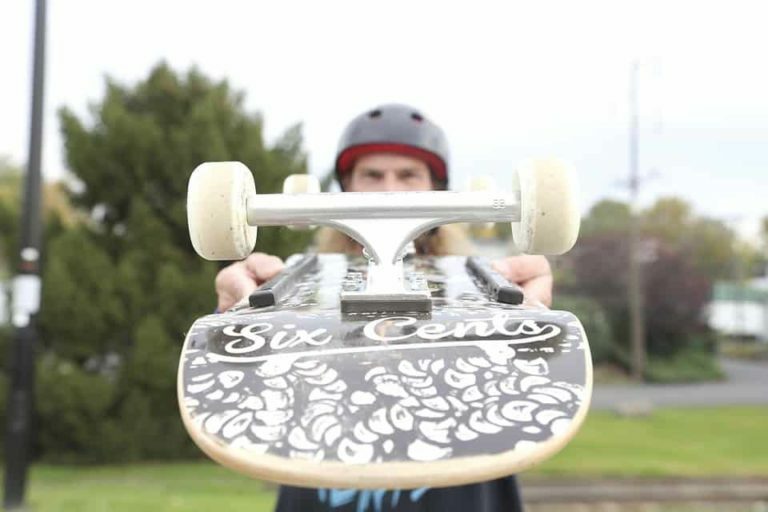 Choosing the right size deck for you is a tricky thing to answer because it all comes down to you as a skater. For example, some skaters ride an 8-inch wide board because it offers them a good amount of stabilization but can be flicked easily too. Other skaters, skate 8.5 inches for more stability and slightly less flicking action. Ultimately, it all depends on your personal preference. However, we will try our best to help you choose the right size deck for your ability and style of skating. A good place to start when choosing a skate deck is the width. The width of the deck is probably the most important of all the decisions you need to make when it comes to the size of your deck. This should be a size that offers good stability for the size of your feet but allows you to flick your board easily too. For most people, this size is between 7.75 and 8.25 inches. Of course, if you have bigger feet, this could mean that an 8.5-inch deck is better for you. If you have smaller feet a 7.5-inch board could be perfect. Ultimately, the width of your deck depends on whatever makes you feel the most comfortable and lets you skate the way you want to. You also have other considerations to make too like the length of the board. The length of the board may not affect you too much if you are of average height like ourselves, but for those shorter and taller skaters out there, it can make a massive difference. If you are short, you may benefit a lot from a board that has a short length because it means you don’t have to slide your feet up the board too far to Ollie and things. The shorter length means that you can stand with your feet shoulder width apart and have all the stability that you need. If you are taller, a longer board may be better for you. A longer board will mean that you can comfortably stand with your feet shoulder-width apart and feel stable. There are other sizing options too like wheelbase and nose and tail sizes too. However, these aren’t as important when you are starting out. These should come into consideration when you know the size of board you like and want to buy a similar size. So, while wheelbase, nose and tail sizes are important, for your first board, just focus on the width and length and find something that you feel comfortable on. Let's start with this cool deck hanger. You can whack this one your wall and display your board as the work of art that it is. It will stop anyone having a cartoon moment slipping on your skateboard and falling down the stairs, which will keep your mum/partner happy! After all, keeping the boss happy is the most important thing in the world! If your boss ain’t happy, you ain’t skating this weekend! If your freaking out about the thought of nailing a hanger to the the wall, try this instead. This is a parking block, it will keep your board off the carpet and walls and out from underneath everyone's feet! We've tried to compile this list with options for every skill level, budget and style of Skater. We have ridden most of the boards (or at least the brands) ourselves and honestly think that any skateboard deck mentioned below would be a fine choice. Obviously there are so many decks available we can't possibly try them all, but we'd be interested to know your favorite brand in the comments below. Of course, the look of a skateboard deck isn’t too important, after all, if you are going to slide it, the graphic isn’t going to last too long. But you may as well buy a board that looks cool as well as feels cool because life’s too short not to have a cool skateboard! This Real Board comes in at 7.75 inches and has an overall length of 31.25 inches. This is perfect for anyone who has skated for a few years that wants some stability and control while being able to flick their board easily as well. Whether you skate street, park or bowl, this Real board will help you nail tricks on any sort of terrain. The feel of this board is very familiar from the moment you set it up. The board feels great and looks great, and it takes no time at all to wear it in and start landing your tricks. The teal color is really nice and looks great with white or raw trucks. Stick some brand new white wheels on this deck, and you will have the freshest set up at the park. We love the graphic on this board, it is fun and makes you smile every time you see it. This makes this deck the perfect companion for a trick battle. When you are battling a trick, it’s nice to have some comic relief, and this deck will always bring a smile to your face. Of course, Deathwish is known for having some of the best feeling boards in the business and this 8-inch deck is certainly no exception. It feels lovely from the moment you set it up and the shape will last you a very long time. Deathwish is also known for being very strong, so this deck will keep on popping no matter how many gnarly tricks you try! ​A little more expensive than some of the other decks on this list, but well worth the money! The best skateboard deck for pop can be quite subjective. We may like the ones below, but your thoughts may differ. It’s cool if they do, these are just the boards that we love popping the most. Give them a try and see what you think! As we’re sure you know, Baker and Deathwish are made by Baker Boys Distribution so they are very similar and many share the same shapes. However, this Baker doesn’t have the colorful fun that the Deathwish above had. So, that’s why it is one of our top picks for the best popping decks. Baker boards have a fairly shallow concave which helps popping, at least in our opinion. Although the concave may be mellow, the pop you can get out of it is anything but. However, this type of shape may not be the best if you are a beginner. You may be better off choosing a board with a lot of concave to help you get off the ground for longer. However, for anyone who likes skating street, park, and bowl, this is an excellent board for all three of them. It allows you to pop high when you need to and get the job done on transition too. ​The shape may be too mellow for some beginners, but others may love it! This is Chris Joslin’s pro model from Plan B. it comes in at 8.375 which is an odd size, but a fair few skaters like it and so we certainly aren’t judging. Of course, Mr. Joslin is known for his massive gaps and being able to do every trick in the book down them. But how does he do it? Well, he uses a board with excellent pop, of course! This Plan B has a great shape to it. It doesn’t have massive concave, but certainly isn’t lacking in it either. The nose and tail are lovely for doing normal and Nollie tricks, and it is just a really well-rounded deck that will keep you skating for a long time whether you skate street, park or bowl. If it works for Chris Joslin, it will certainly work for us! We couldn’t get it to hardflip like Joslin does, perhaps this is user error! There really isn’t anything wrong with this board. It is made by one of the best skate companies in the world for one of the best skaters skating right now! With 7.75 and 8.0-inch decks being the most popular sizes of skateboard, we thought we would test some and see which ones we liked the most. Here they are, these are our favorite 7.75 and 8.0-inch decks at the moment. It should come as no surprise to see an Element Deck Review in our top list. This 7.75 Element board is a great board for anyone with small feet. Perhaps you are just starting out, or you’ve been skating for a while and aren't quite ready to take the leap up to an 8.0 or 8.25. This board is a great size for street skating. It provides a good amount of control but is still great for flipping and flicking. Element boards have a good concave too. They are not to steep at the nose or tail, but not too mellow either. They are the perfect combination of flickable and rideable. We would say that this Element board, in particular, is perfect for the skater who has some control and likes to skate parks, it will do everything you need to do in a park and help you on the streets as well. ​Element boards can chip quite easily (at least in our experience) this doesn’t do too much structural damage to the board but can be annoying for appearance's sake. Enjoi decks are a great starting place for beginners. They have fairly mellow pop, so they are great for getting your bearings on a board, but they aren’t so mellow that you will quickly outgrow them. In fact, you could skate Enjoi boards for your entire skate career and never feel like you’re missing out on any pop, style or control. Enjoi boards are all about having fun, and you really do feel like you’re having more fun when you ride one. This 8.0-inch board from Enjoi brings with it some laughs to be had while your learning and perfecting your tricks. Go and grab one and have the ride of your life! These skateboard decks are made by professional skateboard companies, you won’t find any knockoff rubbish here. However, they are great for beginners because they are slightly cheaper, but will still allow you to enjoy a skate and get comfortable on a board. They just might not hold up to too much abuse. Darkstar is a very good company, but in recent years they have dropped the price of their decks dramatically. This is great for beginners because it allows you to get a really good deck for not too much money. This means that you can get to grips with skating on a professional quality deck and start landing tricks on your first board! Darkstar says that their boards are stronger than the industry standard. This certainly seems true, you only have to look at the riders of Darkstar to see this. Ryan Decenzo, a big rail, stair and gap rider skates for Darkstar so if he can skate the biggest gaps in the world, a Darkstar is going to last you a long time in the streets or at the park. Once the epoxy resin begins to fail, the whole deck may begin to separate, but this will take a long time! Bamboo Skateboards are made from, not surprisingly, bamboo. Bamboo is a very strong material that can flex slightly more than hardwoods like maple. Now, the board also has layers of maple, but the bamboo plys help to keep the board going for longer. This Bamboo deck has quite a deep concave which means that the tail and nose are a little higher off the ground than other boards. Some beginners will love this because it will allow them to ollie higher, others may find it a little too high if they like to skate transition. We were very impressed with this Bamboo Skateboard it is great for anyone starting out in the skate world and is well worth a try. If you just want a cheap deck to cruise around on or to see whether this skating thing is for you, give one of these a try, they are cheap, but should last you long enough to get bitten by the skate bug! Blank decks are a thing of beauty, you can save money when you buy a blank deck because you aren’t spending money on the design that is on the bottom. This can help if you are a skater on a budget, and let’s face it, most of us skaters are on a budget! As long as you choose the right blank deck, you are going to get a good quality board too, just like this Warning deck. These decks may not have the professional quality that others boards on this list have, but they feel good under your feet and will last you a few months. For any skater on a budget or someone that just wants to get started skating, this is a great deck to buy! Mini Logo decks are made by Skate One, a skateboard manufacturer home to other companies like Bones and Powell-Peralta. Basically, Mini Logo is the company’s street division, and they make some great boards for not that much money at all. Mini Logo has always been a silent killer lurking in the background in skate shops. They make some of the best bearings in the world and some of the most underrated boards too. 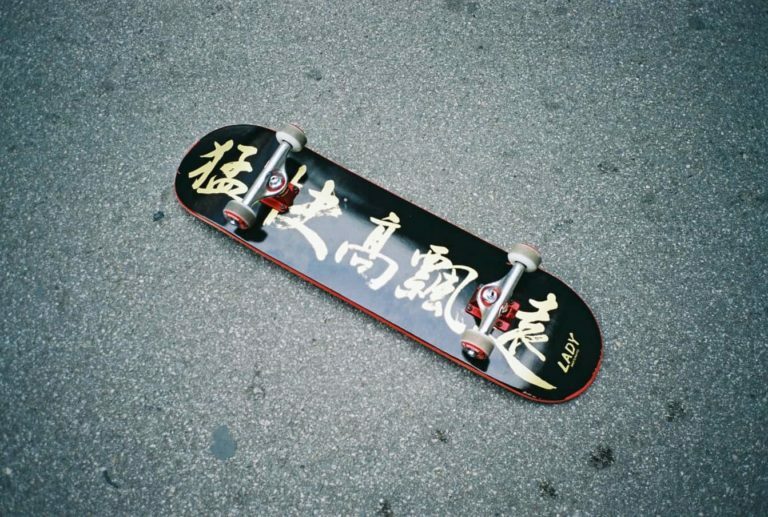 A Mini Logo deck is perfect for any skater in the world. They have loads of sizes and designs to choose from, and the boards will last you a long time of hard skating. Whether you are on a budget or just fancy skating one of the most underrated decks in the skate business, grab yourself a Mini Logo, you won’t regret it! Honestly, Mini Logo makes great boards. They may chip slightly easier than other decks, but they will last you a long time, and they are the perfect deck to buy if you are on a budget or just starting out.